Without a friend’s recommendation I probably wouldn’t have found Bar Tabacchi. Its presence on Google is strangely almost non-existent and its narrow street front is marked only by a small sign, in the typical style of Italian tobacco shops, and by two elegant weld gridded arches. Upon entering you’ll most likely hear jazz, chosen by the bartender from a record collection ranging from Billy Holiday to Nas to Tom Waits, depending on the mood and stage of the evening. The bar’s main light source comes from a large feature lamp hanging low over a high communal table in the back section of the room. Hanging wooden panels line the wall opposite the bar behind which a wall to wall mirror expands the otherwise small space. Tasteful flower arrangements bring life to a handful of spaces dotted around the place. Other than that, the interior is simply decorated. Needless to say, the atmosphere at Bar Tabacchi is laid back yet subtly refined. Perch yourself at the dark wooden bar around 7pm on a Friday night and take a breath as your work week stress dissolves amid the quiet chatter of a handful of drinkers. However, as the night wears on, things can escalate and if you stumble in at midnight on a Saturday night you could find yourself among a lively crowd, unable to find a seat. But don’t expect the waiters to be happy about you ordering a tray of shots for you and your rowdy friends. This is the kind of establishment that may frown upon those who don’t take their time to enjoy their drinks. In their eyes, what’s the rush? And it’s exactly this mentality of savouring the sweeter things in life in a soothing atmosphere that Bar Tabacchi celebrates. Its owner, Matthias Haberl, wants his customers to feel relaxed, at home even, still indulging in an experience you can’t get in your living room. He was inspired by the Italian attitude towards enjoying life, where you can order an Aperol Spritz at any time of the day. He puts an emphasis on quality without the pretentiousness that can sometimes accompany good food and drinks. Many of the customers have been regulars for years, some even as long as the 6 years Bar Tabacchi has been open. One couple even met in the bar and have since married. Matthias attended the wedding, of course. The staff are friendly - there’s none of the typical Viennese "the waiter is king" culture in this bar. 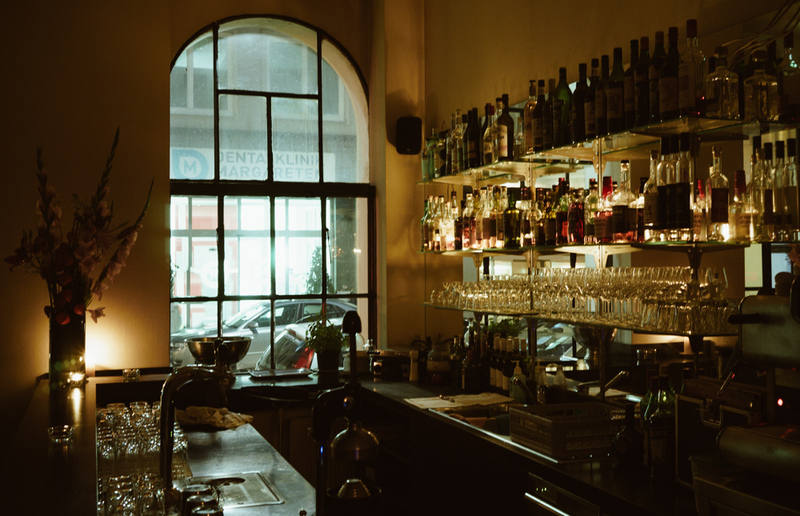 They’ll happily walk you through the drinks list which includes Schremser as the sole tap beer, both coloured grapes, aperitifs, an extensive whiskey list and a new selection of vermouths. Their cocktail list has all the usual favourites and they will take requests as best they can. If you’re peckish you can indulge in one of Vienna’s more upmarket toasted sandwiches, a prosciutto plate or a mouth-watering truffle sausage. Bar Tabacchi can be your local or it can be a place you venture to on a bar hopping night for one of Vienna’s best espresso martinis, arguably matching what Roberto’s American Bar serves up. And who knows, you may even meet the human of your dreams there and be Bar Tabacchi’s second successful blossoming romance.